Editor Leigh Hargrove gets a closer look at our 2009 Canadian National Women's Champion, Alison Testroete. With only 3 full seasons under her belt, Alison reflects about her win, the success of her season, her love for cycling and what's on tap for 2010 in this exclusive Q&A. C4W: How did it feel to win the Nationals this year? AT: I was so happy, it means a lot to me to be National Champion, it's very prestigious in my mind. C4W: What was your goal going in? AT: Nothing super specific; I just wanted to put myself in a position to get the best possible result and give it everything during that race. C4W: You were 5th in 2007, 14th in 2008 - what has changed over the years to bring you to the podium? AT: 2007 was still a great race; I was on Express Copy at that time and we won the race. This year my mentality changed a bit. I ended up working for 8 months and taking a break from cycling. I realized I loved cycling, and there was more there for me. Maybe now I'm more grateful to be living this kind of lifestyle. Being frustrated or having some bad days isn't the hugest deal in the grand scheme of things. Perhaps I've gained a bit of faith? C4W: What elements were different in the race that helped you win this year? AT: It was largely the course and the dynamics of the race itself. It seemed like everybody wanted to win, so the non-sprinters were initiating breaks, and the sprinters were chasing them down. I'd have to race pretty humble if I wanted to stick around for the finish. Plus, it was a fun bike trip with my teammate Gillian; there was no stress, no pacing back and forth, or 9pm bed times. C4W: How did the rest of your season go? AT: I'm really satisfied with it and very grateful for the opportunities I was given. C4W: What was it like racing with Team Total Restoration in the 2008 season? AT: It was a great experience; everybody on the team is fun, easy-going, just good solid people. Cory and Marni, who run the team, really embraced me–I think we were all excited to just race bikes. C4W: Who are you racing for next year? AT: I basically need to get better at time trialling and put in some solid climbing miles this winter and then help the team win races. C4W: Future goals in cycling? AT: Race at the highest level I am capable of. I'd like to move to Europe and race there. C4W: Do you still speed skate? AT: Not really, not since '05, but I might see if I can do a bit of it this winter. C4W: Why do you love cycling? AT: I just really like racing, the fluidity of riding a bike, and the speed that's generated. The personalities and tactics of it keep my mind engaged. It's a tough sport, there's always a challenge. Plus there's room for so many different types of bike riders. C4W: Toughest thing about bike racing? AT: Probably the solitude that comes with winter training rides. I miss the group training atmosphere in speed skating. 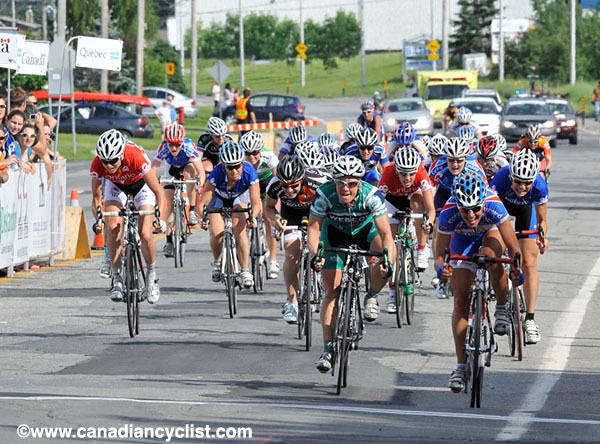 C4W: Best thing about bike racing? AT: The good days, when you're just caught up in the moment, and everything feels easy. C4W: Do you have any tips for those getting started in bike racing? AT: Well, I would say, once you realize you love the sport you need to create a plan. It's all about generating your own opportunity. I think it's important to have a coach, join a club/team. It's about racing hard, especially on the women's side. Unless you're winning big races, don't expect anything; you need to apply for teams and ask people questions who've had success. Let yourself be known. AT: Nationals this year, and other times when I've helped other people win. C4W: Do you have a training mantra something you tell yourself in order to get through your next interval? AT: I suppose I cheer myself on, just tell myself I'm doing really good, even if I'm not. C4W: Any comments on the cycling scene for women in Canada? Do you see where it could be improved? Do you know of any programs that are working well towards improving women's participation numbers in competitive cycling in Canada? AT: For myself, I really benefited from my high school mountain bike club and race series (SPOKE). It was fun, and introduced me to mountain biking as a sport. 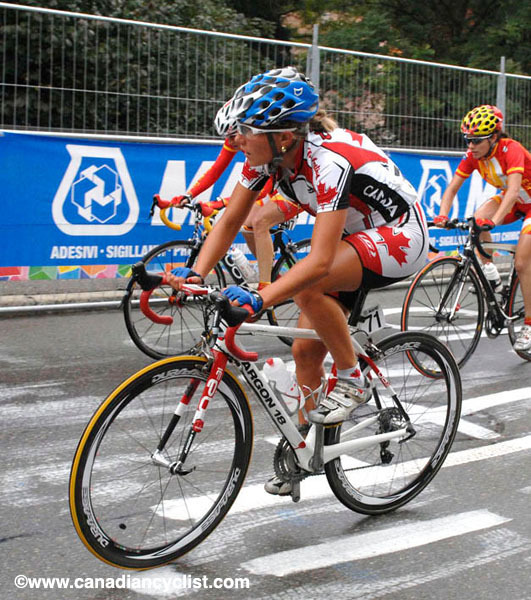 The Canadian Cycling Association (CCA) has made positive steps toward women's development by providing opportunities like training camps and racing exposure. If the younger kids could spend time at races or training camps with the older people, I think it'd be a great step in helping them figure out how to make it in this sport. I believe the youth should be targeted as a whole, the guys help make the girls better, at least they have for me. AT: There isn't really a favorite, but I like the styles of people like Ina, Marianne Vos, Emma Johansson, Nicole Cooke. AT: I most certainly don't know enough, but I would say Evan Guthrie and Allison Beveridge.